1. Mash the butter with the garlic, ginger and chillies. Sprinkle scallops with sea salt. 2. Place the butter mixture in a small frying pan or griddle. Allow to bubble so the chilli and ginger flavours permeate it. Add the scallops, season and cook for 2 minutes. Turn each scallop and cook for 30 seconds -1 minute. 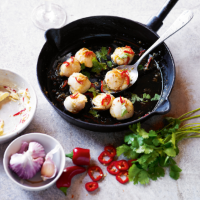 Serve topped with coriander leaves and drizzle over the buttery chilli sauce.